I’m pretty sure that any review of the Kia Rio should have some link back to Brazil, or a little Blue animated bird, or maybe even both. I am lucky (cough) enough to have a partner that hails from the great South American country of Brazil and as such have visited the vibrant city of Rio. I have been to see Christ the Redeemer and traveled on the cable car/gondola to the top of Sugarloaf mountain, I have even played football on Copacabana beach and I have to tell you that driving Kia’s new Rio offers you none of that experience – well maybe the music depending on your playlist. However, what the new Rio does offer up, is a strong, peppy ride that feels secure on the out of town roads and right at home in the city – mind you, (just like the wife) it does like to chat. The Rio’s 7” touch screen Infotainment system has all the mod cons (such as Carplay and Android Auto), the sound system is more than adequate, Reversing Camera that is sharp and clear (with parking sensors that I’d hoped would play something a little more exciting than simply beep) and a very talkative Navigation system. Now don’t get me wrong, it works and works well, it’s just that even when not directing you anywhere, the navigation guidance system happily informs you of merging roads, narrowing roads and speed camera lights – shut up, shut up, shut up (well maybe not the last one)! I’m sure you can switch it off, but we (the family) enjoyed the correspondence – made a change from the family’s other female voice – snigger. The Rio’s styling is very familiar, especially if you hail from Europe (it’s award winning too). LED daytime running lights and LED’s at the rear. Aerodynamic grille that floods the engine bay with cool air, wing merging headlights, wide beam fogs, a strong profile stance and when you lift open the tailgate, there’s 325L of luggage capacity to play with. The interior is clean and uncluttered, which is where I see the majority of Kia’s new look heading – and I like it. Leather seats and wheel (that has plenty of buttons and dials to keep you occupied and negate the need for your hands to leave it). Drivers aids such as Cruise control and Hill Start Assist are there to ease any driving pains you may have and the 3.5” LCD instrument cluster is again easy to work around. Carplay and Android Auto are easily accessible and the 6 speaker sound system is adequate (but not ear-bleedingly loud). Under the bonnet of my review car was a 1.4L DOHC CVVT petrol engine whose 74kW joins you at 6,000 revs while the 133Nm comes in a little earlier at 4000. When attached to Kia’s 4-speed automatic with sequential sportshift it will give you a reported 6.2L/100k’s worth of fuel economy – it is quite difficult to make that fuel needle move. No blind spot alert – I had to do it manually and look (surprised at how easy that was to do) but it did come with a reversing camera to ease the stress on my neck area – no need to overdo it. From my small family point of view, the new Rio is spacious and ideally suited for most household chores. The rear 60/40 seat split allows for oversized items to be accommodated without too many complaints from our youngest member and we certainly didn’t find ourselves on top of each other as with some other small cars. It drives well and the rubber on the 17” Alloys grips the road comfortably during frisky maneuvering. 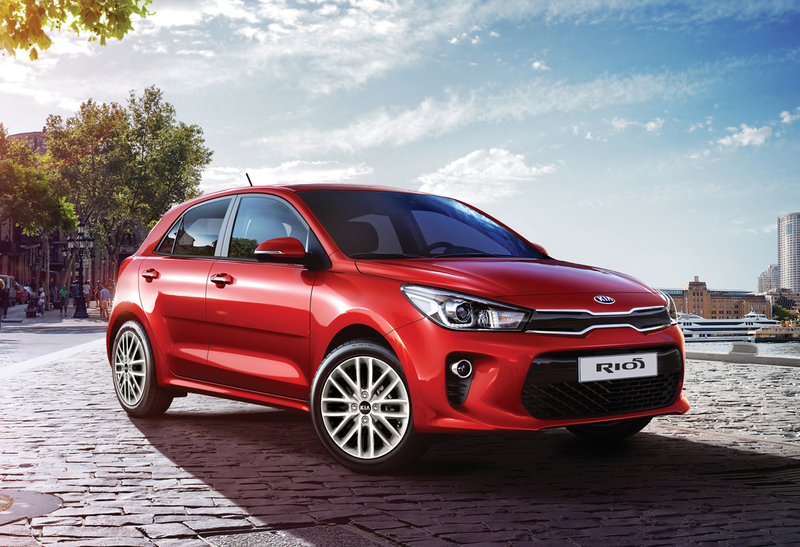 With its European styling and improved connectivity, the Kia Rio is quite a treat. It’s small enough for the town but roomy enough for that weekend away. It’s responsive to drive with plenty of ‘connection’ to the tarmac. On a final note, you may want to explore that navigation system, it really is a regular chatterbox (mind you, the Rio does have a lot to talk about). Maybe if it spoke in Portuguese (like the wife) I’d manage to tune it out easier?